In order to train and educate people in teams a learning organization should be created. A learning organization is the perfect environment for team growth. It involves having a business climate that is conducive to learning as well as several other components mentioned below. The purpose of this paper was to explore the necessary details for creating such a group. There are several ambient factors that are essential to these conditions. The first is to know the learning strategies and motivators for adults. Next, is to decide what types of teaching methodologies work best with the teams involved. After that, the first type of training that must be conducted for adults in teams is communication and dialogue instruction. That section is necessary for team survival and further growth of the group. What follows next are ideas on measuring the results of the training, and the importance of providing opportunities to practice. The paper finishes with information about current paradigms in training compared with more traditional training programs. It becomes apparent after examining this data that teams and training are natural allies but all the portions of a learning organization are necessary. Simply said, all of the parts must be in place for the survival of the whole system. A companys ability to survive is based on two important details. They are continuous improvement and continuous learning, characterized by what has come to be called the learning organization. People start life off by wanting to learn how to walk and talk. This is a very natural act for babies, wanting to learn. Consequently, education and training, is a way of life that most Americans accept for the first seventeen years. We grow up with those processes and the benefits are tremendous. People learn how to survive through their educational experiences, as well as how to work and enhance their chances for more profitable employment. The goal of learning is to help people develop. Philosophically, we presume that people are learning beings. Courtney (1992) says that all humans share the propensity to learn and to confront the world existentially as learning beings. Therefore, it is easy to see the meaningfulness that education and training has for an individual. Following that, teams are the most natural and fundamental building blocks of society and the structure that people learn best in. People begin learning in teams from early ages. Families, athletics, social clubs, businesses, churches or any other conglomeration of people are good examples. Fisher says the strategy for energizing the best efforts of everybody in a cooperative environment must be driven by teamwork (1996). However, great teams rarely start off that way. Usually, they start as a group of individuals who come together for a common cause. It takes time to develop relationships and working niches. Also, Senge says it takes time to develop the knowledge of working as a whole, just as it takes time to develop knowledge of walking or riding a bicycle. In other words great teams are learning organizations (1994). This combination of learning and teamwork is a quintessential ingredient for successful, competitive organizations. Companies must recognize the value that teams have for learning and vice versa. For continuous growth, employees ought to be equipped with the appropriate tools; education being one of the most vital. An analysis of adult learning is the first step to understanding how to produce exceptional learning for teams. The concept adult education (andragogy) has been studied and analyzed exhaustively from as early as 1924. In order to maximize the effectiveness of adult learning, models and theories need to be examined. Many considerations are necessary when educating adults; a few of them follow. Mature people learn in social settings, and learning centers can be a myriad of places, school, work, home and so on. It is there that interactions occur. These can be a sharing of events, an exchange of knowledge, or other methodologies to transfer information. The second substantial point is that adults also bring to the classroom a lot of real life experiences that need to be considered when conducting courses and designing curriculum. In other words, adults have a lot of previous knowledge, are self-directed and dont like to be lectured to. Lastly, this group is motivated to learn to resolve problems or fill gaps in their knowledge. It is because of these reasons, social situations, prior knowledge, and problem resolution that learning in teams is a natural environment for adults. Next and equally as important are the different learning styles, which help people assimilate new pieces of information. The learning processes and learning styles are equally as important as motivating factors. David Kolb, a developmental psychologist, synthesized and expanded the work of John Dewey, Kurt Lewin, and Jean Piget to develop an adult learning cycle. This cyclical, experiential process has been broken into four stages. Concrete experiences, which simply means one becomes fully involved in an experience. This is the doing stage, performing a job and keeping an open mind. Observe and reflect on the experience from many perspectives. At this stage the point is to think about and review what processes occurred during the experience. For instance how well did it go? Create concepts to integrate these observations into logically sound theories. What happens here is that an awareness occurs between the ideas and actions. Thoughts begin to formulate new hypotheses; such as, what might be a good behavior to enact or follow? Testing implications of concepts means using these theories to make decisions and solve problems. At this level is where one decides on a method. And the cycle starts all over again. Accommodator  one who wants to get fully involved in any new experience. Consequently, the motivators for adults to learn, as well as the cycle and learning styles, contribute to retention and assimilation of new material. These three elements are significant to team dynamics. These contexts dictate how new material should be presented to individuals and teams. There are many reasons why understanding adult learning theories is imperative. The most important being that unless one perceives how adults learn and new information is processed, education most likely would be a waste of time and money. Basically, a Learning Organization serves many purposes. The first is as that of a center where employees can learn specific job skills. Another is for personal growth and the third, for acquiring team-building expertise. The types of training methodologies that organizations can use for teams are numerous. Senge (1990) says it cannot be stressed too much that team learning is a team skill. A group of talented individual learners will not necessarily produce a learning team, any more than a group of talented athletes will produce a great sports team. Learning teams learn how to learn together. Some of the ways they do that are described below. Cross-functional teams or task forces continuously strengthen a business as well as help individuals and teams learn themselves. The important point here is to have a diverse composition of team members to represent many viewpoints. This diversity among the team forces people to work outside their area of expertise and therefore gain additional knowledge while contributing new viewpoints. Job rotation helps individuals and teams to learn continually. How this works is by allowing employees to learn other specific duties and jobs. This new learning and exchange of knowledge contributes to an entire team and business. Often what happens is that employees bring new experiences to a task, results in better and faster methods. This also helps the organization be prepared for future growth. Workouts, is an organizational development strategy invented by GE in 1989. This is where teams are brought together and go through an intensive problem solving experience for several days. This learning approach empowers participants continuously. Instead of just using employees in this learning session, others involved in the companys day-to-day activities are included (i.e. customers, suppliers, etc.). Action Learning was coined by Kurt Lewin (1940s) and further developed by Revans, an organizational consultant in England. 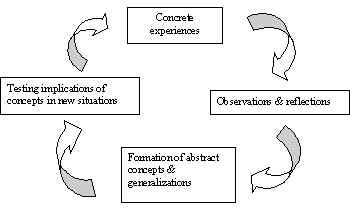 Dilworth (1995) has researched this model that is designed problem environments. He asserts they are imperative to group learning experiences and problem resolution skills. It is believed that teams learn and grow more when the settings and problems are not familiar. Revans has used teams from one company to visit other businesses with the intention of solving problems that are completely out of subject matter knowledge. Succession planning is usually reserved for senior managers. The models contention is to move the next in line manager up a level. This scenario proves that there is continuous learning when the entire company follows these guidelines. What happens here is the manager shares her future job responsibilities with the current manager. Career pathing is similar to job rotation in that learning processes are shared by all. The workforce develops a just-in-time readiness so that others can easily assimilate into new positions. People are trained in other positions. Mentoring programs are very popular in the Japanese business environment. Their history goes back to the Samurai warrior days when older masters helped the younger ones to succeed. The idea here is that senior managers nurture and monitor the development of other managers. Employee exchange programs are basically cross-peer coaching programs. Employees positions overlap each other so that cross learning is continuous. People are put into experiences where they have little knowledge so that new ideas can be shared. When people are absent from their position those around absorb the duties and the workflow isnt slowed down. Distributive learning uses computers that employees can resource for learning. Instant feedback and solution sharing is possible with this methodology. Multicultural issues are more easily dealt with on this platform because of the distributive network and ease of use. Formal training is still used but not as prominently in organizational learning. Classrooms serve in bringing together cross-sections of employees for interactive experiences, including team-building techniques, and shared problem-solving strategies. Town meetings are a good opportunity to mix diverse groups of people. This type of training approach can be motivational, a time to share corporate goals or a session of company-wide team building. A lot of theatrics accompany this methodology usually. Celebrations of success are directed toward a teams success rather than an individual. These are events that mark high point in the learning process. Concentration is placed on actions done correctly for the team rather than mistakes. In the 1990s, reward systems began shifting from extrinsic to intrinsic; meaning that organizations realized money wasnt always the best motivator. Companies began leveling management and employees in order to create team cohesiveness. Another technique was to offer flexibility in both work hours and locations. Self-directed teams lie at the nature of a learning organization. This is how many firms direct business as well. Utilizing teams for many purposes allows learning to happen through new encounters and opportunities. E-mail interconnections allow for communication to cross all company boundaries and hierarchical lines. Possibilities exist for specific interest groups and trouble shooting assemblies as well as interaction on many different levels. Cross-peer tutoring allows an organization to get information from a variety of sources. Peers offer support to each other. This is analogous to an athletic team that shares its talents through peer training and coaching. This particular method exemplifies teamwork as information and skills are quite easily moved around the organization. The useful piece of information to remember here is that organizations endorse different training methodologies and incorporate learning styles knowledge into the curriculum and learning experiences. All organizations will learn, however, some much better than others. Dilworth (1995) believes that the problem is that many organizations today are learning disabled or cause workforce members to learn business practices not suited to the time. Not using training effectively, shoddy on-the-job training and formal environments are prime contributors. Another important factor is practice. Senge (1990) stresses that learning teams need practice fields, ways to practice together so that they can develop their collective learning skills. Organized learning within teams can accomplish many goals; one being to accelerate the relationship building stage in human development. This is done through "ice breakers" or "warm-up" activities. Both of which encourage communication and trust. Another purpose is to transfer a specific skill set where both employees and teams learn. English says the goal of learning is to make the new skill a natural part of a persons repertory of performance (1998). The types of training programs available for adults are endless. The four key areas are technical, personal, business knowledge and team building. Senge begins team learning with "dialogue", the capacity of members of a team to suspend assumptions and enter into a genuine "thinking together" (1994). The word dialogue comes from the Greek word dialogos. Which essentially means a flowing of meaning through a group. Dia meaning through and logos representing word. The word and significance of dialogue means taking the place of discussion, which usually has a persuasive connotation and a winning attitude. Neither of which are really the grounds for providing a team-playing environment. there must be a "facilitator" who "holds the context" of dialogue. These three conditions allow meaning to flow through the group and on to the individual. Consequently, they are essential for learning new views and discovering information. When teams utilize these three components deeper learning takes place. Simply said, new knowledge is processed quicker and retained longer. Next, trust is developed and members begin to recognize and value differences of the members. People learn how to shape their ideas rather than being shaped by them. On the issue of conflict resolution, training and skills in those areas are necessary for the longevity of teams. The simple fact about learning is that it is judged after the fact and sometimes during the process. People want to know how well did one learn to read or swim or dance and the results are seen in the demonstration. Organizations want to know how well the team did in producing or managing the new information. Senge says that results include profit, time to market, customer loyalty, or other agreed-upon measures of effectiveness. Learning must ultimately be assessed in terms of "how well the game is played" (1994). Also, learning doesnt happen overnight. As a Ford manager (Senge, 1994) pointed out recently, "If calculus were invented today, our organization would not be able to learn it. Wed send everyone off to the three-day intensive program. Wed then tell everyone to try to apply what theyd learned. After three to six months wed assess whether it was working. Wed undoubtedly then conclude that this calculus stuff wasnt all it was made out to be and go off and look for something else to improve results". One of the problems with measuring results is that organizations often do it too quickly. A lot of patience is needed here. Also, results are often compared to some arbitrary fixed number, which might not be valid at all. Thought needs to go into the measurement stage, as it does in the design and instructing phases. The training and development field has been undergoing some fundamental changes. The forces behind this momentum are examining scientific theories about systems generating models to include learning and thinking. Senge (1994) uses an analogy: " A cloud masses, the sky darkens, leaves twist upward, and we know that it will rain. We also know that after the storm, the runoff will feed into groundwater miles away, and the sky will grow clear by tomorrow. Each has an influence on the rest, an influence that is usually hidden from view. You can only understand the system of a rainstorm by contemplating the whole, not any individual part of the pattern". Such are the workings of human endeavors; translucent ties but nonetheless a whole. There are no equal parts and everything must be examined in relation to the whole. In essence what this means is that training is becoming more holistic. The table below demonstrates the differences between traditional (formal) training and the new learning organizations (systems thinking) that is underway. A lot of the components and events in the world can be classified as systems. Senge (1994) says that businesses and other human endeavors are also systems, bound by invisible fabrics of interrelated actions. Sometimes, this makes it difficult for those connected and isolated to see the whole picture or "pattern of change" within a system. Systems thinking is one way to improve our perception of organizational learning. That there is team cohesiveness and a full commitment for participation in learning. Senge (1994) believes that team learning transforms skills into capabilities and that they are collective vehicles for building shared understanding (1994). Following that, the strength of any team is built upon the collective efforts of the individual members. One of the most essential threads is for teams to learn communication skills and the ability to carry on thoughtful dialogues. Studies have shown that that talent is the one that has ensured longevity and growth in teams more than any other does. It is often the most difficult. But if teams take the approaches above to developing learning organization then the process is a little easier. One of the reasons why I am adamant about individuals learning more about themselves is that it always helps in the communication process. Which stands to reason that if they can discern their learning styles, assimilation of new information is easier as well as techniques for understanding others. The importance of utilizing different methods to instruct or transfer knowledge is very important also. Involving adults in the learning process is what keeps their interest. Therefore using methods, which encourage participation, helps to ensure knowledge transfer. Finally, it is the combination of all these elements that contribute to team cohesiveness. And this synergy is indicative of companies that achieve their goals. Butterfield, J. & Pendergraft, N. (1996). Gaming techniques to improve the team-formation process. Team Performance Management: An International Journal, 2 (3) 18-23. Chawla, S. & Renesch, J. (Eds.). (1995). Learning organizations: Developing cultures for tomorrows workplace. Portland: Productivity Press. Cole, R.E. (1989). Strategies for learning: Small-group activities in American, Japanese, and Swedish Industry. Berkeley: University of California Press. Courtney, S. (1992). Why adults learn: Towards a theory of participation in adult education. London: Routledge. Dilworth, R. (1995). The DNA of the Learning Organization. In Chawla, S. & Renesch, J. (Eds.). Learning organizations: Developing cultures for tomorrows workplace. (pp. 249-255). Portland: Productivity Press. Fisher, B. and T. (1996). Real dream teams: Seven practices used by world-class team leaders to achieve extraordinary results. Boca Raton: St. Lucie Press. Loo, R. (1996). Training in project management: a powerful tool for improving individual and team performance. Team Performance Management: An International Journal, 2 (3) pages . Renner, Peter. (1993). The art of teaching adults. Vancover. Hignell Printing Ltd.
Senge, P. (1994). The Fifth Discipline Fieldbook. New York: Doubleday. Senge, P. (1990). The Fifth Discipline: The art & practice of the learning organization. New York: Doubleday. Vaill, P. (1996). Learning as a way of being. San Francisco. Josey-Bass.